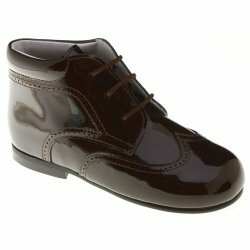 Chocolate Brown colour baby boys and toddler boys boots in patent leather. 100% leather high quality boots hand made in Spain By Tinny Shoes For Cachet Shoes. Man made sole. Sizes given in continental sizes (& UK sizes in brackets). Please see sizing guide to convert US sizes.